The strength of contemporary experimental cinema has encouraged us to meet and to film the most active filmmakers, distributors, movers and shakers in this art form. This developed into a number of autonomous portraits, forming a series demonstrating the plurality of approaches and practices in experimental film. Our independent productions introduce or complement the work of the artists, technicians, distributors and programmers who participate in the life of contemporary art cinema. Frederique Devaux and Michel Amarger have been making experimental films and documentaries since 1980. Frederique Devaux is film critic and professor. Michel Amarger is a journalist, specializing in cinema, for Radio France International. 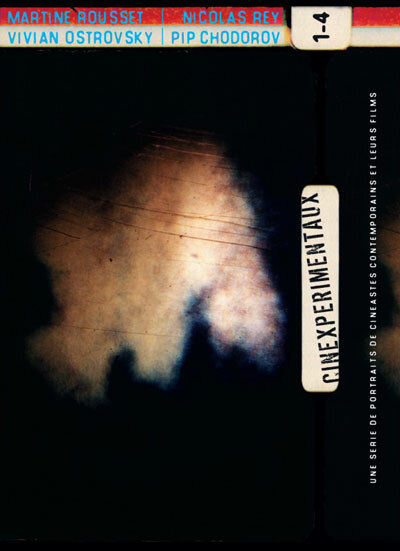 This DVD contains: Cinexperimentaux #1: Martine Rousset, 2000, 13 min Cinexperimentaux #2: Nicholas Rey, 2001, 13 min Cinexperimentaux #3: Vivian Ostrovsky, 2001, 13 min Cinexperimentaux #4: Pip Chodorov, 2000, 13 min All rights of the producer and of the owner of the work are reserved. Unless authorized by the rights holder, no duplication, hiring, lending or public screenings are allowed. For institutional purchase please contact Re:Voir directly. The strength of contemporary experimental cinema has encouraged us to meet and to film the most active filmmakers, distributors, movers and shakers in this art form. This developed into a number of autonomous portraits, forming a series demonstrating the plurality of approaches and practices in experimental film. Our independent productions introduce or complement the work of the artists, technicians, distributors and programmers who participate in the life of contemporary art cinema. Frederique Devaux and Michel Amarger have been making experimental films and documentaries since 1980. Frederique Devaux is film critic and professor. Michel Amarger is a journalist, specializing in cinema, for Radio France International. This DVD contains: Cinexperimentaux #1: Martine Rousset, 2000, 13 min Cinexperimentaux #2: Nicholas Rey, 2001, 13 min Cinexperimentaux #3: Vivian Ostrovsky, 2001, 13 min Cinexperimentaux #4: Pip Chodorov, 2000, 13 min All rights of the producer and of the owner of the work are reserved. Unless authorized by the rights holder, no duplication, hiring, lending or public screenings are allowed. For institutional purchase please contact Re:Voir directly.